This weekend has definitely been difficult. Last night was "Saturday night." I was a perfect Nutritarian all day until the evening. Then, my husband started with the questions. "So, what are we going to do tonight?" I guess I could have said, "nothing!" But.....I chose not to. I am a pleaser. If I had said "nothing", he would not have been pleased. So we spent about a half hour discussing our options and settled on staying home but getting take out from California Chicken Cafe. He picked up Vegetable soup and a chicken wrap. Yes, I had chicken last night. It was the very first time in 13 days that I actually ate something from an animal. I actually ate an animal. Well.....it was chicken. Does poultry really count? I would have preferred a steak. I had a couple of pieces of diced chicken instead. I should get some credit. Anyhow it was delicious. I ended the night satisfied, but a little guilty. I immediately got back on track this morning with fresh fruit for breakfast. Watermelon is saving me. I just don't get tired of it. Another thing I don't get tired of is almond butter. The almond butter that I buy from Whole Foods is made from almonds and nothing else. There are absolutely no additives. I've made it myself in the past, but buying it is so much more convenient. I cut up a crispy pink apple this afternoon and dipped it in the almond butter. It not only tasted great, but it really helps to curb my sugar cravings. Now, if I can make it through dinner as a Nutritarian, I'll have another day under my shrinking belt! I haven't eaten a romantic meal with my husband in 11 days. Why do I equate fattening meals with romance? Well, it's the idea of a date. The meal usually starts off with a drink, and then slowly moves to a salad and entree, all the while lingering over conversation and discussing all aspects of our life. Tonight was different. First of all, I was not completely ready to give up one night of being a Nutritarian. I wavered back and forth between staying strict to my diet and being a fun partner. My relationship won out. (The one with my husband, not food) oh, wait a minute - maybe both. It's hard enough to abstain from meat, bread and oil. To do so and lose the support of your mate is hard. He would have probably been fine to eat and drink heartily alone, but I would have felt bad. It's probably just another hurdle to get over. So.....I broke Dr. Fuhrman's 6 week plan. Still, I did not eat anything like I would have in the past. I ordered a large salad with vinegarette on the side and a cup of lobster bisque. This is going to be a long week end. Today has been a very tough day living as a Nutritarian. It didn't start out that way. I woke up early, had a lot of energy, and ate an apple with delicious natural almond butter from Whole Foods. A couple of hours later, I had a snack of ice cold juicy watermelon. I thought I was well on my way to completing another successful day. Then, fatigue and weakness set in. I couldn't bear to make a salad with "no oil" dressing. The thought of eating it was just too unpleasant to go through the effort of making it. I had a couple of errands to run so I decided to stop by Whole Foods on the way back and pick up something ready made and healthy. It really wasn't that easy. There were tons of Vegan items that looked somewhat appetizing, however when I read the labels, they almost always had some sort of oil added. Now if I was on weight watchers, or most other "diets" this really wouldn't be a problem. But Dr. Fuhrman doesn't want us to eat oil in the first 6 weeks of his plan. He believes that all oils, even olive oil are really empty calories that lead to disease. I walked around the store and got more and more discouraged. Finally, I went to the bean aisle and bought a package of black beans. I decided to go home and make a salad and struggle through lunch. But.....I got lucky. I heated the beans, added some fresh salsa, and a really good balsamic vinegar. In a matter of minutes, I had one of the most flavorful soups I have ever eaten. Seriously, it was that good. I also made a romaine salad with avocado dressing. By the time I was finished I was full and hopeful again that I will make it through another day. I woke up so hungry today! I went into the kitchen, walked past a box of Croissants, and opened the refrigerator. Thank goodness I still have fresh watermelon and pineapple left. I didn't think the fruit would satisfy my hunger, but I was wrong. After I ate I felt fine and better than I've felt in a while. I spent the day doing laundry and much needed housecleaning. My energy level remained strong until about 4:00 pm, when I decided it was "quitting" time. For dinner I am going to eat the rest of my salad that I made for lunch and a vegetable soup that Tony bought from Chicken Cafe. I am milking my trip to the doctor yesterday for an extra day and letting my dear husband wait on me. Part of getting healthier requires keeping up with necessary screening tests. I am happy to say that as of today, I am up to date with all. In preparation for today's test I had to do a strict fast. Unfortunately that meant no nutrients at all yesterday. I did a complete cleanse which left me quite hungry today. I ate a bowl of vegetable soup for lunch, and mushroom barley for dinner. The doctor suggested that I pass on salad. Today will complete an entire week that I have been "eating to live". I'm a little surprised with myself that I have lasted this long. Most of my writing on this blog in the last few years has been full of excuses and self exploration. If you will notice, however, most of what I have written about in the last few days, has strictly been about what's actually been on Patti's plate. It's almost like I have been holding my breath for fear of talking about something else and deviating from my goal. I think with the completion of week one of the six week plan, I should reflect and express the changes if any this difference of lifestyle has made. First of all, physically, I think I do feel somewhat better. It's hard to say, and probably still too early to tell, but I feel that the pain in my legs has been slightly alleviated. I noticed tonight going up and down stairs took a little less effort than usual. Weight wise, I've lost a few pounds, but my scale and weight fluctuate often and I know that one week is not enough time to see a real difference yet. I have been sleeping in later in the morning which actually surprises me. I would think that lighter eating would make me bounce out of bed. I am just going to attribute it to my body recognizing that something different is going on and it is learning to adjust to a higher nutrient consumption. It actually may be a little "in shock". By the way, last night I went to a birthday party for my nephew, Tommy. It was difficult to stay on track in a party atmosphere, but I did! Thankfully, his mother, a doctor, was wise and kind enough to have an alternative to chips with the guacamole. I am allowed one cup of oatmeal or whole grains a day. I decided yesterday would be the perfect time to start my day with oatmeal since I went to the dentist the previous day and I am not in a chewing mood. However, I usually top my oatmeal with brown sugar since it tastes much like cardboard when I just add water. Since I am not eating sugar, I improvised in a a most delicious way. I added sliced sweet strawberries and a finely diced medjool date. I kid you not when I say it was better than brown sugar. For lunch I ate the rest of my salad from the night before (chewing on the left side of my mouth). I snacked a bit on fruit and vegetables. Since Saturday night is usually date night for my husband and I, I was happy I had an excuse to stay in. I don't know if I would have the willpower to continue if I was out at one of our favorite restaurants. My dental visit gave me to perfect excuse to recuperate at home and order in. We ordered from a restaurant I found online that I had never heard of before. I did a little googling and came up with a Vegan restaurant, VEstation. I had a bowl of vegetable curry with soy chicken. Tony had the same with the addition of a spicy noodle dish too. I thought it was delicious but Tony was very quiet. I didn't pay much attention to his carefully guarded bowl through dinner. After dinner when I was doing dishes I noticed that he left most of his food in his bowl. There was an especially large mound of soy chicken. Poor guy. He's being very thoughtful helping his wife get healthy. Food on hand and preparation of ingredients are key elements for success. I drove in a circle earlier this week trying to decide where to buy my groceries. I buy different things at various markets and I truly couldn't make up my mind where I should start. I'm glad I settled on Costco. In the past I have opted for Gelson's for a few quality produce items. I buy a small amount and pay a lot more but I feel confident that my food won't sit in the back of the refrigerator rotting. I finally made my decision to head to Costco and stock up. I'm glad I did. You can't beat the quality of their fruits and vegetables and the cost is always right. I love their vine ripened tomatoes and sweet white onions. I refrigerate the onions and find that it makes them even sweeter for salads. I also love their bags of sweet multi colored peppers. Usually I hesitate when buying their large bags of romaine lettuce. I wonder if we can really go through so many heads before they go bad. This week's shopping trip I decided to just go full board. I even bought a large bag of spinach. I am happy I did. It has made this week of salad making convenient and easy. And, there will not be one bit of waste. Today is the start of my 4th day of the "Eat to Live" health plan. I am extremely surprised and proud of myself for sticking with this eating plan for as long as I have. Anyone who has been following me for the last few years knows that my attention span for a new way of eating usually lasts about a couple of hours. Dr. Fuhrman says that I should give it 6 weeks for the health benefits to really kick in. Since today is the start of the weekend, it will be a real test of my commitment. Also, I have a dentist appointment today. I am the worst patient in the world. I have dental anxiety. In the past, when I finish a dreaded task, I reward myself with food and drink. It's like a little celebration. Hopefully, I will break that pattern tonight. Now for the description of my delicious salad from last night as promised. 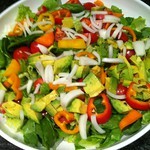 I cut up a big bowl of romaine lettuce, spinach, tomatoes, onions, avocado, and pretty colored peppers. Meanwhile I pan roasted mushrooms in their own juices, (no oil or cooking spray), and I roasted garbanzo beans in the oven. 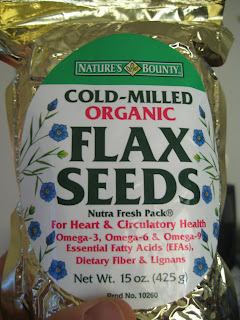 I added those to the salad later because both are high in purines and not welcome food for my husband who has gout. The star of the salad was the dressing. I blended rice vinegar, balsamic vinegar, 1 garlic clove, 1 Medjool date, sea salt, pepper, onion powder and oregano, and a teaspoon of almond butter. I added a bit of water for consistency and drizzled all into the salad. It was absolutely delicious. Hmmmm. I am exhausted tonight. I thought I was supposed to have increased energy. Oh well. I have done a lot today. I would actually probably be asleep by now if I had eaten a bowl of pasta for dinner. I am pleased to report that I just completed one more day of super healthy eating! I started my morning with a big bowl of delicious fruit. It actually kept me satisfied until about 11:30 when I ate the rest of my salad from the night before. Then, I went to work and seriously didn't think about food once until dinner time. While I was cooking, I ate a huge bowl of crunchy, sweet, sugar snap peas and was very happy. 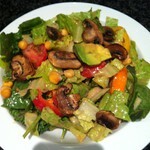 Dinner was a big salad that was so delicious, it deserves it's own post tomorrow. I didn't even miss my usual salad dressing. Good night for now. So, I made it through another day! Hurrah! It really hasn’t been as terrible as I thought it would be. I was anticipating getting a giant headache from “bad food” withdrawal, but I guess I normally really don’t eat that poorly. I am eating so many good carbohydrates, that the bad ones that I am used to eating, (sour dough, croissant, English muffins) are not missed as much by my body. Even my mind isn’t missing them that much yet. I have to admit, so far my husband has been a real help. He has never been on a diet a day in his life, yet he has graciously supported me the last couple of days. Last night we had salad for dinner again with a non-oil dressing. I guess you could say we had steamed broccoli for desert. Not one word of complaint by him was uttered. I don’t feel much different yet health wise, but I am happy that I am actually giving this a real try. I have to admit, so far more than anything I have missed my olive oil. My salads have been good and different than what I am used to, but I would enjoy them much more with my usual dressing. However, I am going to hold on to Dr. Fuhrman’s teachings and not deviate. 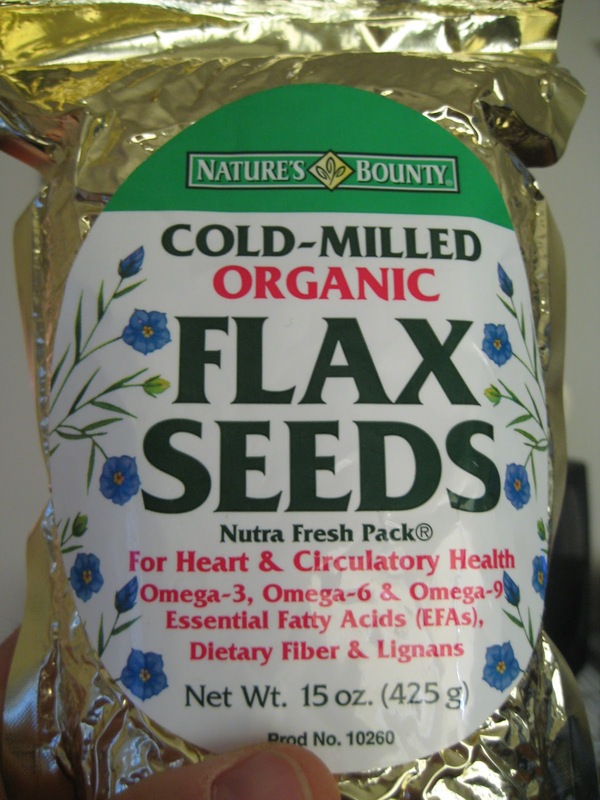 Today I need to buy some flax seed to sprinkle on my salads. Although I will be spending extra calories on something that I have no desire to even eat, I am doing it for the potential health benefit. I need to remember I am eating this way to get healthy, and the smaller dress size is an added bonus. I did it! I completed my first day as a Nutritarian. I could have probably made my meals a bit more interesting, but I was called back to work right when I was leaving the house to go to the Farmer's Market. I ended up making dinner with what I had on hand and I even passed up a late night invite to meet my daughter for a glass of wine. I made a kale and cabbage salad with a strange non oil dressing, and my husband ended up loving it.Our hot entree was corn on the cobb. I actually was quite full, however I understand why Dr. Fuhrman named his book Eat to Live, and not Live to Eat. Well, at least I got through Day 1! After several months, I decided to log in today to reacquaint myself with my blog, my diet, and my past. The first thing I noticed is that I somehow lost a few postings from earlier this year. I am not sure why they disappeared or where they went, but oh well. I am not going to worry about lost entries when I really didn't show enough interest to keep up on my writing in the first place. Today is a new day and I am on a new eating journey. I am almost finished reading Dr. Fuhrman's book, Eat to Live. He basically believes in high nutrient based eating for health reasons, and if a person follows a diet like that they will naturally lose weight. It makes a lot of sense. So, I have decided to give it a try. I did a little bit of shopping yesterday at Whole Foods and bought a few products like Kale, apples, and almond butter. I was so weak from hunger that I cut the shopping short and went home and rested and decided to continue my shopping today. Unfortunately, my dryer broke and I have an appliance repair man coming today so I can not go out until he leaves. That gives me one more day of an excuse of not going full board into this plan. However, I did start my morning off with a crisp green apple and a bit of almond butter. At 2:00 pm Dr. Fuhrman will be on the Dr. Oz show. I already have the DVR ready to record.